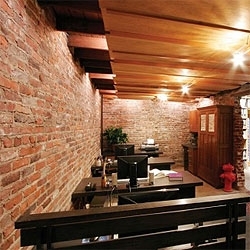 AxD refurbished an old building into their studio and gallery, leaving masonry exposed and mixing it with wood resulting in a comfortable interior. 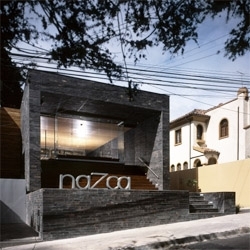 The Nazca Restaurant in Bogotá, Colombia features a big stair on its facade, that acts as an outside space for the restaurant. Designed by Giancarlo Mazzanti. 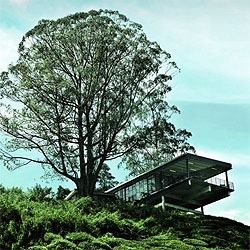 The BOH visitor center in Malaysia uses a steel structure to enclose a space full of natural light overlooking tea plantations. Amazing views, simple materials. 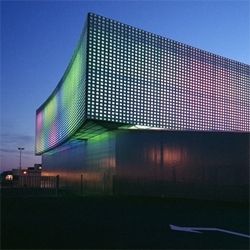 Le Prisme is a colorful structure, a new venue for theatre, concerts, fairs and sports events. Designed by Brisac Gonzalez. I love leaning buildings. 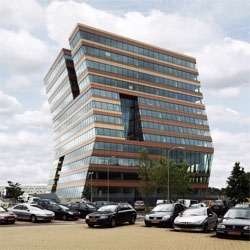 This one is the Menzis office building by Cie in Groningen, Netherlands. 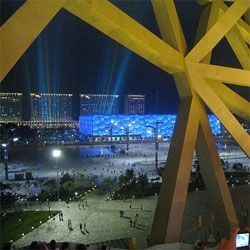 Manuel Ocaña’s Pictures of the colorful insides of the Bird's Nest in Beijing. A not so common view of this iconic building. 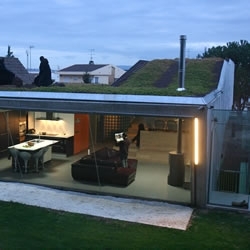 Located in Spain, this house has a complex and industrial-looking mini golf course on its roof. 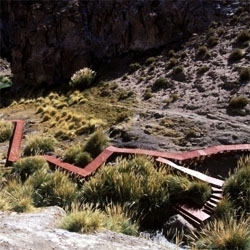 Puritama Hot Springs is a delicate work over a unique landscape in the Atacama Desert. The new JCrew men's store in NYC looks amazing! They took over an old tavern and kept the bar. 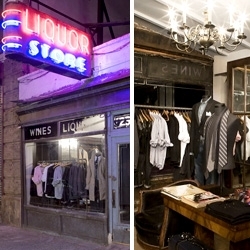 More pics at A Continuous Lean, and jcrew.com's got a cute little vintagey intro for the store as well! 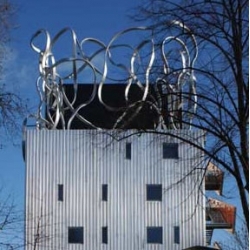 Alsop's architecture is always exciting, his Goldsmiths College is no exception with its funky scribbly sculpture. 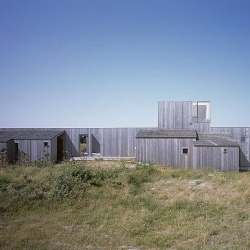 Nice wood summerhouse in Danish Kandestederne, designed by Arkitektfirmaet C. F. Møller. 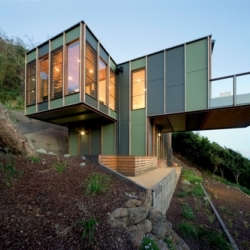 The aged wood makes the house blend with the beautiful landscape, almost camouflaging the structure. 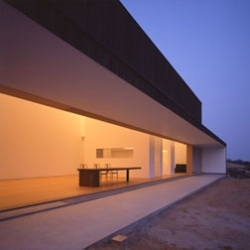 Watchhouse Brinta located in a field in the dutch country side, is the latest project by Rianne Makkink and Jurgen Bey. 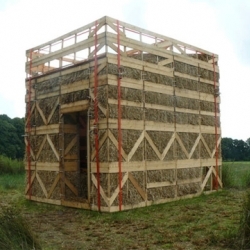 The small house is made from wood and straw. 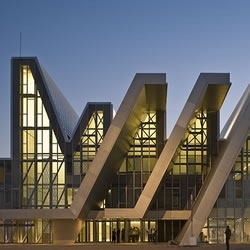 Guilherme Machado designed this civic centre in Matosinhos, Portugal. 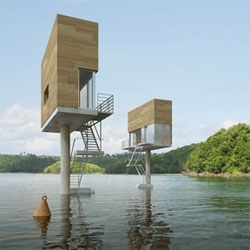 Designboom has a great roundup of tiny houses, both built and conceptual. 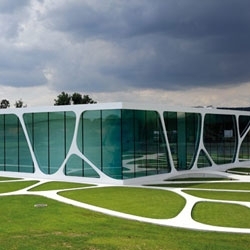 Leonardo Glass Cube by 3deluxe - I love how the detailing of the facade is picked up in the ground work. 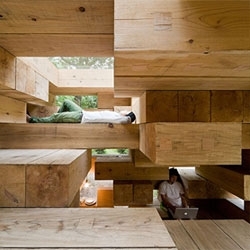 Sou Fujimoto Architects' amazing TINY Next Generation House in Japan - conceptually, a house made out of jenga blocks. 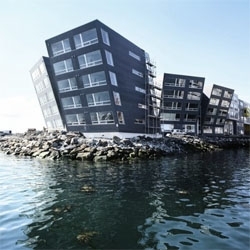 Norwegian architects 70ºN designed this leaning buildings that really overlook the Tromsø strait. 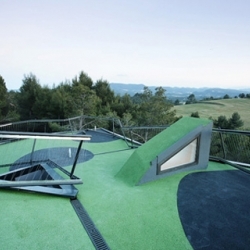 ADD+ designed this house over a slope, with a complex roof that is actually a mini golf course. 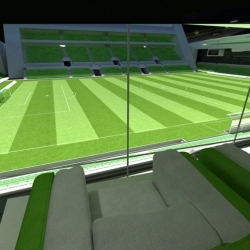 Architects MZ & Partners have designed a planned new underground stadium, which will house 11,000 spectators in Doha, Qatar. It will be a world first and it will also be fully air-conditioned. The Nisha Bar Louge in Mexico City features colorful interiors. 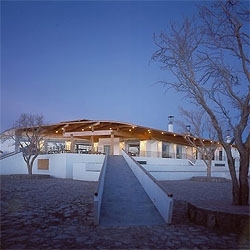 The Explora Atacama Hotel by German del Sol, chosen as one of the best hotels in South America by Conde Nast Traveler. 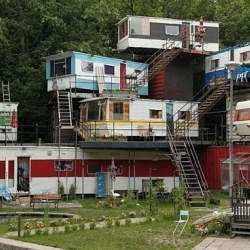 It's been coined as Trailer Mansion and it's pretty awesome. 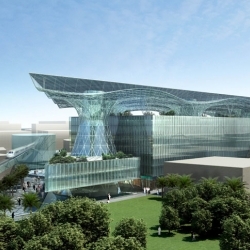 The first "mixed-use positive energy building" being build for Masdar in Abu Dhabi, UAE. 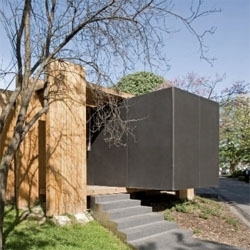 By Adrian Smith + Gordon Gill Architects. 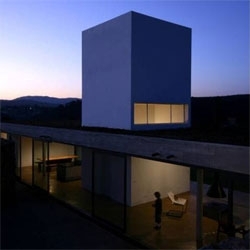 A hillside house in Ushimado, Japan by Tezuka Architects - the entire rear facade opens up via some sliding doors. 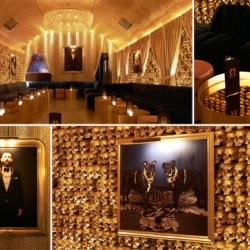 Matt W Moore (MWM) did the artwork at the much anticipated Revolve Clothing Retail/Concept store launch! 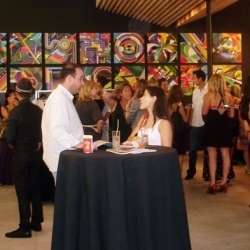 Check out pics from the opening! 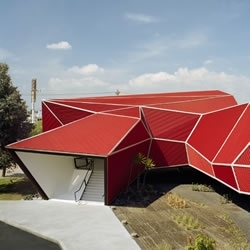 Interesting wood structure for this centipede like pavillion in Portugal by Guilherme Machado. 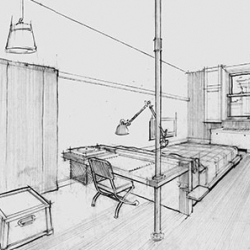 First sketches and information on the soon to open Ace Hotel New York turned up. Cannot wait for this one to open! 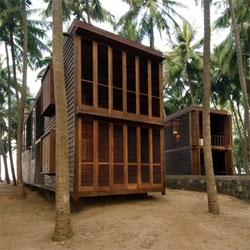 Studio Mumbai's Palmyra House, constructed from louvers made from locally harvested Palmyra trees, allowing the facade to be both open and airy or closed for more privacy and protection. 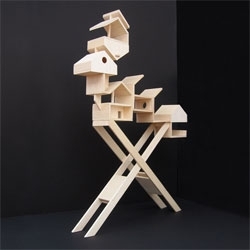 Not just a bird house - a bird apartment complex! 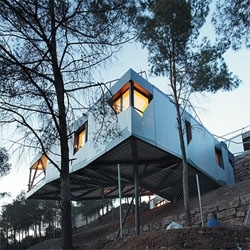 Maxime Delporte's La Mangeoire project. 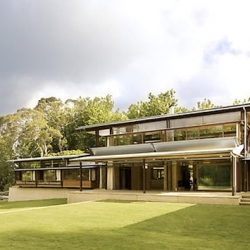 Jackson Clements Burrows Pty Ltd Architects, making architecture which empathizes with its surroundings, designing within perceived constraints. 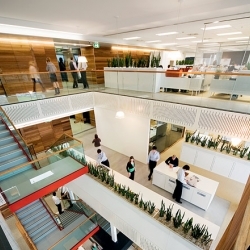 This gorgeous office re-adaption by Bligh Voler Nield recently won a NSW award for its airy open spaces and eco friendly construction. 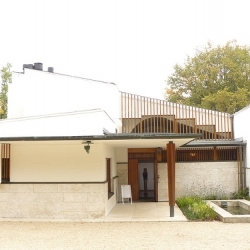 The Maison Carré, which is not far from Paris, is one of the most important private homes designed by Alvar Aalto. 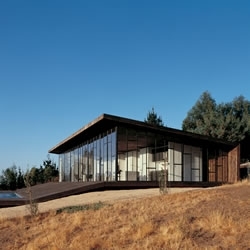 Inspired by Japanese design methods and informed by warm California modernism, the Leura house embodies a new and decidedly Australian brand of contemporary sustainable architecture. 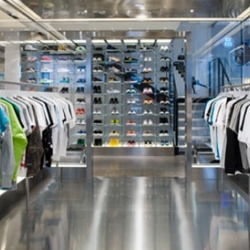 First images of the all renovated Parisian concept store Colette, which opened its doors again today. Nothing short of incredible! 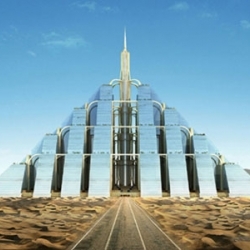 The Mayans and Egyptians constructed incredible feats of architecture able to weather the test of time, but they had no idea their pyramids would inspire the shape of the latest carbon-neutral super-structure to hit Dubai. 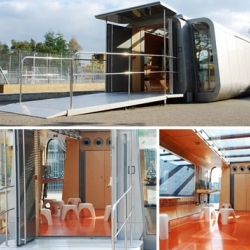 Fragile Lab is an apt name for this retail showroom by Import/Export Architecture. 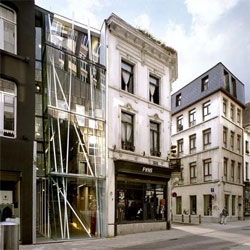 The facade appears tenuous with its off-kilter columns. 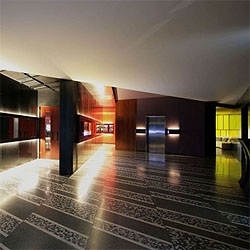 Designboom has some great interior shots. 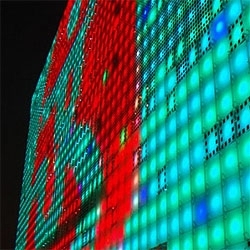 The C-Lab is the Columbia Laboratory for Architectural Broadcasting, a experimental research unit devoted to develop new forms of communication. 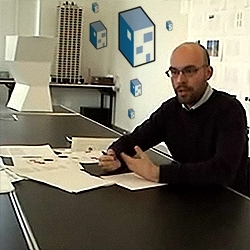 ArchDaily interview with them, explores the role of architects in today's society. 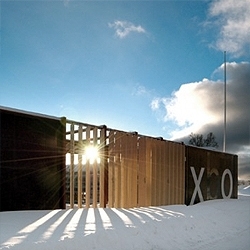 Norwegian architects 70ºN designed this prefab house, a mobile habitat for 2 people. 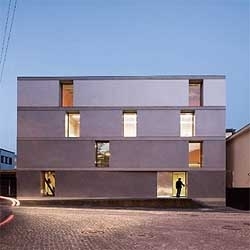 The Joanopolis House by UNA Arquitetos, which uses local Brazilian materials and is beautifully integrated into its site. 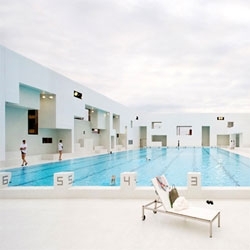 Jean Nouvel's aquatic complex Les Bains des Docks, recently opened in Le Havre, France. 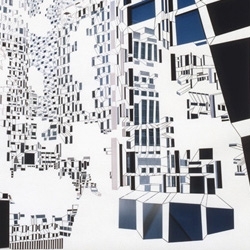 Meticulously and with surgical precision Richard Galpin breaks down the fine top layer of large-scale architectural photographs into geometrical forms and lines.